by Avelino L. Zapanta, 9-30-06 In 1916, the annual Paco carnival in Manila was still very much in vogue despite the war in Europe. The carnival officials invited another daredevil of a flyer to come to the Philippines. Charles Niles, contracted to do aerobatics and risky stunts, arrived Manila early April, already late for the carnival. It seemed that Niles' hosts in Japan, the Military Aviation Society of Japan, had detained him for exhibitions before the Emperor to create favorable impressions on the monarch about aviation. The military's keen interest in aviation was understandable. Japan by then was a developing military power having defeated Russia a decade earlier in l1904 in the control of Manchuria, and had annexed Korea as its colony. Niles had impressive credentials for the job at hand. He was in the Class 1913 of Glenn Curtiss which included some other famous U.S. flyers like Jack McCurdy, Charles Witmer and Ray Morris. Like most early aviators, right off their short flight instruction, they quickly show their proficiency and Niles was one of them. Within the year of graduation he was performing death-defying aerobatics in the U.S. and in Central America. Before coming to the Philippines in 1916 he had already performed in Shanghai, Peking, Hong Kong and Tokyo since November 1915. Niles brought with him two airplanes consisting of a Huntington Monoplane especially built for him by the Huntington Aircraft Company designed for stressed exhibition work. The second airplane was a Christofferson Biplane. His managers, the Friedman brothers Leon and Max were joined by Tom Gunn's former manager Newman in setting Niles up at the Manila Polo Club near Pasay Beach, which was chosen as the site for the exhibition. Niles lived up to expectations. He performed the French loop made famous by Frenchman Adolphe Pegoud in 1913, upside down flying, and other nerve-wracking stunts. He scared the spectators with free falling with engine off and on just in time. He hurtled down to earth at great speed only to level off just in time and land light as a feather. He was a total sensation. He was known for being a crowd pleaser and would take unnecessary risks just to satisfy the crowd. In his last performance in Manila, despite protests from his mechanics and handlers, he flew, dived and performed aerobatics despite knowing there was trouble with his engine, which fortunately gave up only after he had landed that last flight. For all his bravura he won an American girl residing in Manila as wife and left with her in May 1916 to become the last male American barnstormer to perform in the country. In an exhibition flight in Oshkosh, Wisconsin on June 25, 1916, Niles crash-landed and died. The short-lived dangerous career of thrill of three years explains the scant information about Niles in the U.S. aviation accounts, but his faithfully recorded performance in the Philippines and Asia is a testimony to this gutsy flyer that lived to please others. Class of 1913, June-July, Glenn H. Curtiss in front of engine. Back row, standing; 1. Charles F. Niles; 2. Frank Thalman; 3. Mohan Singh; 4. J.L. "Lanny" Callan, instructor; 5. Francis "Doc" Wildman ; 6. John Van Vleet, instructor; 7. Frank Auckerman; 8. Leon Englehardt; 9. Steve MacGordon. CURTISS SCHOOL OF AVIATION, 1913 Editor's Note: This picture and legend can be found in the AAHS Journal, American Aviation Historical Society, Volume 29, Number 3, Fall 1984. It is one of many interesting pictures which serve to illustrate the extensive article about Jack Vilas, "Jack Vilas' 1913 Aerial Yacht', by Merrill Stickler. The picture is credited as a Curtiss Museum Photo. If you can find a copy of the journal and are interested in pursuing the story of Vilas and the other aviators in the Class of 1913, I heartily recommend it to you. You can visit the webpage of the AAHS by clicking on:"
Transcribed by Bob Davis - 9-14-03 "As a memorial to the first flight in a power driven aeroplane, which took place ten years ago, when the late Wilbur Wright piloted his biplane for the first time through the air, five aviators completed a circuit around Manhatten Island, starting from Oakwood Heights, Staten Island. The meet was held under the auspices of the Aeronautical Society and the winner of the prize of $1,000 was W. S. Luckey. It seemed fitting that the decennial celebration should find the victor flying the same type of machine that the Wright Brothers made famous. In sipte of the fact that the monoplane has demonstrated its superiority as a machine whose chief essential is speed Luckey's biplane, a 100 horse power Curtiss, showed its way to the field. Frank Niles, in another biplane of the same make and horsepower, finished in second position, winning $750, and C. Murvin Wood in his 80 horse power Moisnat military monoplane, was third, getting the prize of $500 for his flight." June, 1937 - Number 20 This is an extract from the complete article. It is one of the few references to Charles Niles I can find. If you want to read the whole story month by month, click on the title above. JUNE In competition for the $15,000 Gould safety prize Howard W. Gill was the only contestant and the donor declared the contest off. (Reminds one of the Hearst prize). In Lieut. T. D. Milling's Army Wright, Capt. Charles DeF. Chandler fired the first airplane machine gun. Silas Christofferson flew off a 170-foot wooden runway built on the roof of a hotel in Portland to the military barracks at Vancouver. Unsanctioned Boston meet run on exhibition basis by Glenn Martin, Lincoln Beachey, Quimby, Page, Freeman, Peck, Niles, Terrell, Fish, Hamilton, Blanche Scott, Gray and Patmore. 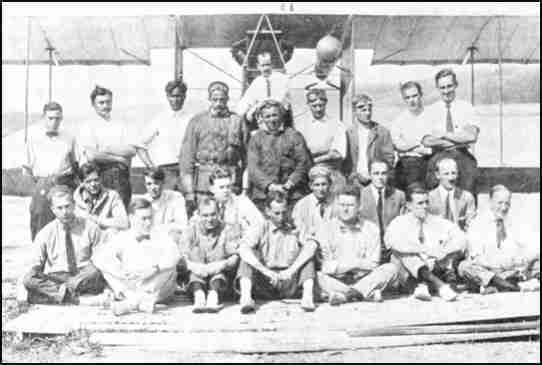 "Twenty-five Years Ago Today - 1915" Early in the month Howard Rinehart established himself at Monterey, Mexico, with two Wright B's and a Wright HS fuselage tractor, to FLY FOR VILLA, along with Eugene "Bill" Heth. A little later Farnum Fish followed Rinehart to Mexico and was shot down by rifle fire. William A. Lamkey, Didier Masson, Dean I. Lamb, Lawrence Brown, Silas Christofferson, George M. Keightley, Floyd Smith, "Mickey" McGuire, Grover Bergdoll, Chas. S. Niles, L. W. Bonney, Alberto Salinas, Gustavo Salinas and J. H. Worden were other Amereican aviators on the various sides during the three years of aerial activity. Transcribed by Bob Davis - 2-11-07 "New York, Feb. 2. - While Charles O. Niles, a youthful Rochester, N.Y. aviator, was making a flight upside down in a monoplane at an altitude of 3,000 feet over the Hempstead plains of Long Island today, his gasoline supply gave out. Tail first, the machine dropped. Niles remained calm, however, and partly righted the machine, landing safely after a series of spiral dives. Niles had ascended to establish a record in loop-the-loop and flying upside down."." ONLINE RESOURCES If you search for "Charles F. Niles" +aviation, using the Google search engine, (5-27-08), you will find about 16 links. Among the most helpful are the following. Airman Makes Two Sidewise Turns This article from the April 19, 1914 edition of the New York Times, which is found in their archives, offers a detailed report on his very exciting flight. You can read the entire article by clicking on the title above. Aviation in the Mexican Revolution Niles is only mentioned briefly in this article, but the story itself is worth the reading. Another version of the story, in Spanish, may be found on the webpage of Didier Masson, on this website. You can access the article on the War And Game website by clicking on the title above. Charles Franklin Niles This page on the Find A Grave website, as suggested by Pete Jones, offers the basic vital statistics, as well as a photograph of the cemetery. You can access the page by clicking on the link above. Niles crash-landed and died on June 25, 1916.